Weekly Comic Pull #17: Beware the Girl of Steel! Okay, I might be a little biased here. A bit. 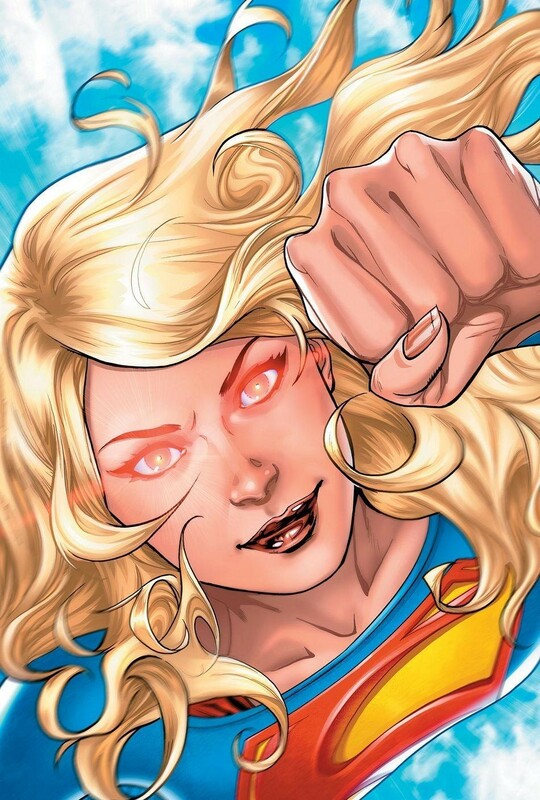 For those who don't know, I'm a massive fan of Supergirl, so considering she's one of my favorite superheroes, I was hoping that her new Rebirth comic would be as good or better as her last series. The verdict? It's pretty damn good, and promises to deliver a great mix of the classic Supergirl along with character and plot threads still left over from the New 52. 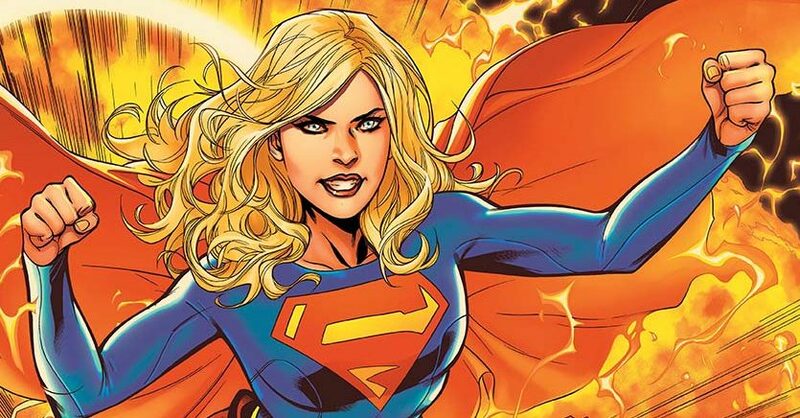 In this issue, Supergirl has finally regained her power thanks to her new friends at the D.E.O., just in time to protect them from (I'm dead serious) a Kryptonian werewolf. Yes, that's a thing. Otherwise, this issue also serves to set up her new status quo with her new secret identity and her cover as a high school student. To that end, one of the things I like the most about this is the fact that, while several elements from the recent CBS/CW TV show are used like her working with the D.E.O., her adoptive parents, and her cover name being Kara Danvers, the comic isn't just the show all over again. Her adoptive parents are assigned to her now instead of having raised her as a child like in the show. Most of the show's supporting cast is largely absent, and instead of working at the show's CatCo Media, Kara is a high school student. But the other thing I loved about this was how it showed Kara's progression since her New 52 series. Back in that series, which ran from 2011 to 2014, she was angry, hot-headed, and hadn't accepted that she would never be able to go home. Over the course of that series until this issue, though, Kara has grown to accept her situation and fully embrace her role as Supergirl. After several years of becoming Supergirl, here Kara really IS Supergirl. Here to help with that is Emanuella Lupacchino, who I'm sad to say won't be illustrating the main series, because her art here is fantastic. Luppacchino had previously worked on the New 52 series, but her work here puts her previous work on the series to shame. The big splash page early in the book is probably one of my favorite splashes in a while. Overall, as a fan and as a comic reader, I'm very glad to say that Supergirl Rebirth is a slam dunk. Here's hoping Orlando can keep the momentum up. It's about time things got a bit...explosive. As the conclusion of this fourth arc, Rising Action, this issue features the climax of the battle between the forces of Ananke and the forces of Persephone. With Ananke's endgame begun, it's a race against time to save Minerva from her fate and to stop Ananke once and for all. Let's just hope Persephone and company can stay alive for that long. Most of this issue is taken up by the battle that begun last issue, and it's as big and bombastic as anything else in this series, but on a larger scale. The confrontation between Persephone and Ananke, and especially that last page, will probably be the among the most memorable parts of this series once it's over with. Jamie McKelvie's art is as impeccable as always, especially with all the colors flying thanks to the gods' various powers going off at once, and I still can't get over how awesome Laura looks as Persephone. I'm almost frustrated that I can't say more about this issue without spoiling it, because the status quo this sets up promises something very interesting. In the near future, September has a one-shot in store for us, featuring a past set of gods in the 1800's. What that will entail, and what it will mean for the future of Wicked + the Divine, I have no clue, but I'm sure we'll have some idea once the main series returns in November. 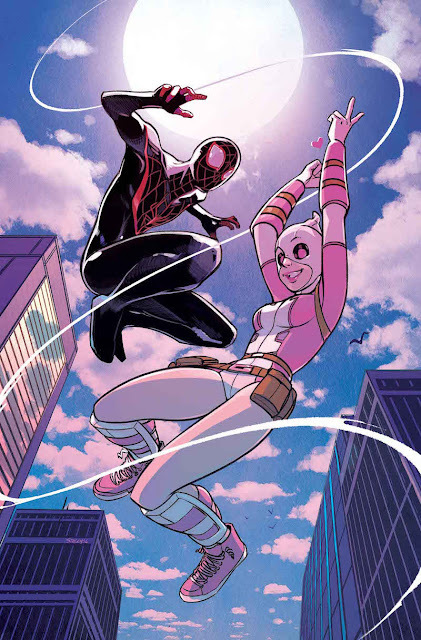 This issue offers the first part of what seems to be a fun little crossover between Gwenpool and Miles Morales. Also in this issue, Gurihiru takes a bit of a break from the book, letting guest artist, Irene Strychalski, take a shot at the pencils. And, for what it's worth, Strychalski actually does a pretty commendable job in this issue, giving the art a bit of an anime feel that Gurihiru always sorta hints at, but never fully embraces. I do still prefer Gurihiru's art, but Strychalski does faces really well. This issue is mostly Gwen running into Miles in the way to meeting a client now that she is running M.O.D.O.K. 's old mercenary company. The resulting crossover is all the more fun since Gwen is an admitted fan of Miles, having read his comics before her entrance into the Marvel universe. In an unrelated note, easily my favorite joke in this was Gwenpool saying that she probably hasn't died because her comic was recently renewed, which is funny in a way that wouldn't be funny for Deadpool. That's the great thing about Gwenpool, her comedy always has a more sardonic and slightly more grounded bent to it than Deadpool's comedy. Next issue seems to continue this crossover while also serving as Gwen's Civil War II tie-in. How much she'll be interacting with the actual Civil War is to be seen, but considering that she only has one issue that tie's in, I wouldn't expect she'll be involved much. Either way, it's set to be a fun issue. In this issue of the Mighty Thor, the world is about to be destroyed by an extinction level event. So, ya know. Typicall stuff. Thor and Agent Solomon are after Dario Agger in order to save his life from the evil Exterminatrix so that Agger can halt a failsafe in his company that would cause the loss of millions of lives. Largely, this issue is a race against time, as Thor fends off mutated Roxxon employees, the Exterminatrix, and even S.H.I.E.L.D. agents who are after Thor to try to reveal her secret identity. That all plays out in one of the most exciting action sequences in this volume of Jane Foster Thor, culminating in probably the most surprising and mindblowing cliffhanger in this entire series so far (a spoiler that the cover of the next issue spoils, so be wary of that). 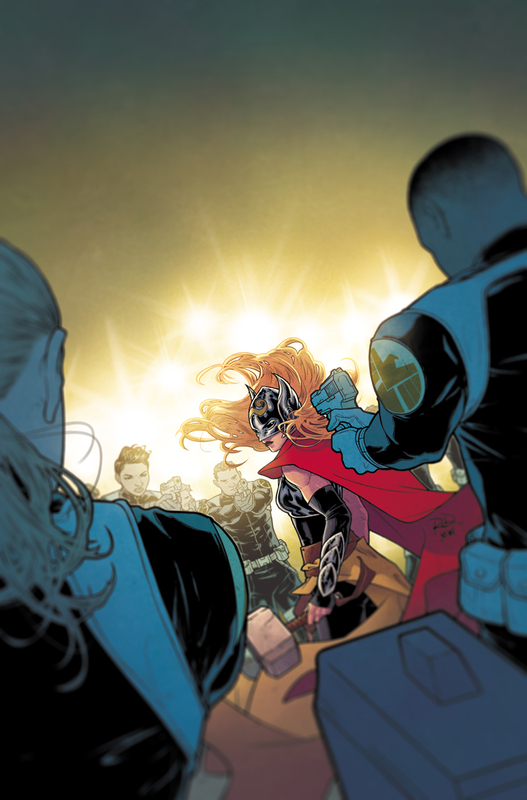 Aaron's writing is as bombastic as ever, Dauterman's art is on point as usual, and everything seems to be culminating to a big finish that'll set the tone for the story going forward, which seems to have big goals if the Marvel NOW! teaser images are to be believed. I've been loving Aaron's Thor since the intro of Jane Foster as Thor, and I can't wait for the next issue. The world is coming apart at the seams. Mysterious creatures are attacking. Humanity is possessed by a consciousness that calls itself "the Kindred." And the fate of the world lies in the hands of 8 people. Just another day at work for the Justice League. 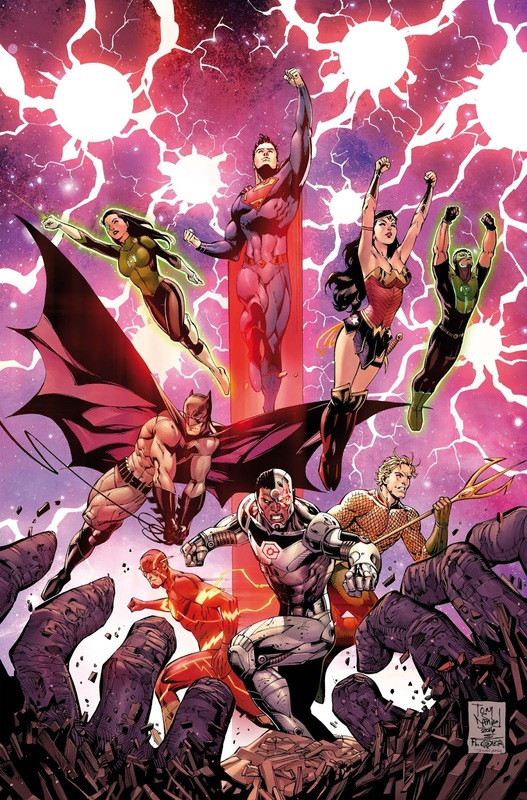 In this issue, the League is getting ever closer to the heart of the matter of who the Kindred are and what they want. But if they want the planet to survive, their newest member, the pre-Flashpoint Superman, will have to risk his like to destroy the mechanisms destroying the Earth from within. On the art front, Daniel is an artist that has occasionally struggled with being able to provide art that's as busy as he likes it but detailed enough to merit the scope, and I think with this issue, Daniel has started to hit his stride, because the art here is notably better than it's been in past issues. On the writing front, things are steadily getting bigger and more cosmic on this end, something I know Hitch has a knack for doing well, so I'm looking forward to just how crazy this story ends up getting. Probably my favorite part was when Batman went to Kent Farm in order to convince the new Superman that the League needs his help. Lois' reaction is honest and it feels tender. And of course, their kid, Johnathan asks Batman if he wants a cookie. That alone is worth the $2.99. Well, that will do it for me. As always, let me know what you're reading down in the comics below. Did you pick up Supergirl Rebirth? What did you think? You liking Justice League? 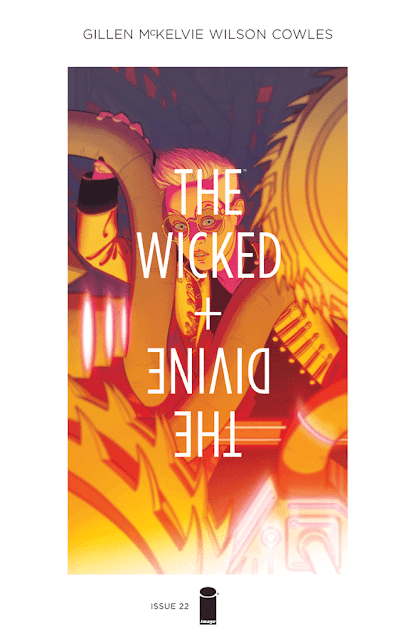 What about that Wicked + the Divine issue? Let me know below, and I'll see you next time!